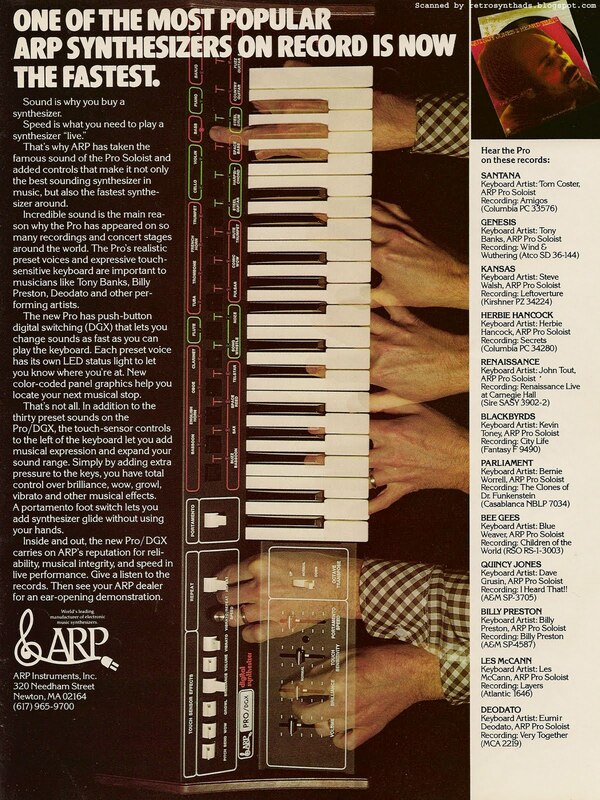 ARP Pro/DGX synthesizer from back inside cover of Contemporary Keyboard April 1977. 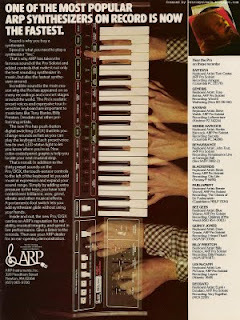 This Pro/DGX ad started appearing on the back inside cover of CK shortly after the instrument was announced in the Spec Sheet section of the February 1977 issue, and dominated the back inside cover up to August, after which a freaky looking Axxe ad started to appear (will blog about that one later). What strikes me about this ad is how crowded it seems - at first glance I can't even tell what instrument the ad is trying to push. My eyes just can't decide where to look first. That was until my friend pointed out that one finger near the top of the ad pressing on the 'bass' button. That finger is now always the first place I look and it's freaking me out. As mentioned in the ad, the Pro/DGX is basically an updated version of the Pro Soloist. I blogged a bit last week about the Soloist-Pro Soloist evolution (with their secret love-child) and the PRO/DGX was the next piece of fruit to fall off the family tree. The big improvement over its predecessor was the implementation of push-button digital switching (hence DGX) for sound selection along with LED status lights, while keeping virtually the same 30 presents and single oscillator design. I've never heard one before and the online reviews are mixed - due mostly to a new filter design. According to the Vintage Synth Explorer page, some say it sounded 'worse' than the Pro Soloist, while the Wikipedia page remains steadfastly on the fence - some describing the sound as warmer than its predecessor while others saying it sounds less "organic". Both sites provide some good basic reference info about the instrument and the VSE page includes a MP3 demo of the presets. "This is not an instrument for the enquiring mind and eager finger. It's just a simple soul that lets you sound like you're being creative, without, in fact, having to be so at all."